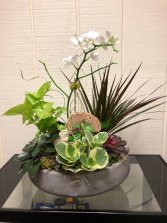 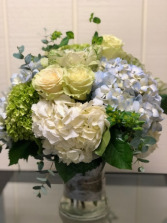 A lush arrangement made with blue and mini green hydrangea complemented with white roses. 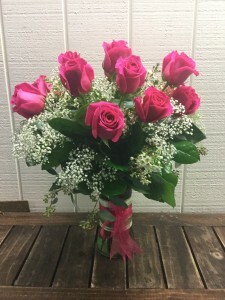 Ideal for many occasions including birthdays and anniversaries. 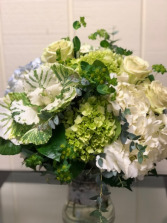 This is a Blossoms at Daileys best seller of Beautiful White, Blue and mini green Hydrangea, White Mondial roses with a few Lovely and Different Ornamental Kale (Available most of the year)Perfect for everyday or any special Occasion.